Another double decker disaster as seen in Chicago on September 11th. 1947 in which fleet #113 - a 1936 72 passenger Yellow Coach modeled as a 720 operating for the Chicago Motor Coach Company (CMC) - has collided with another CMC bus sending our focus careening over a curb and smashing into a tree killing one passenger and sending twenty others to the hospital - no word on the disposition of the driver. 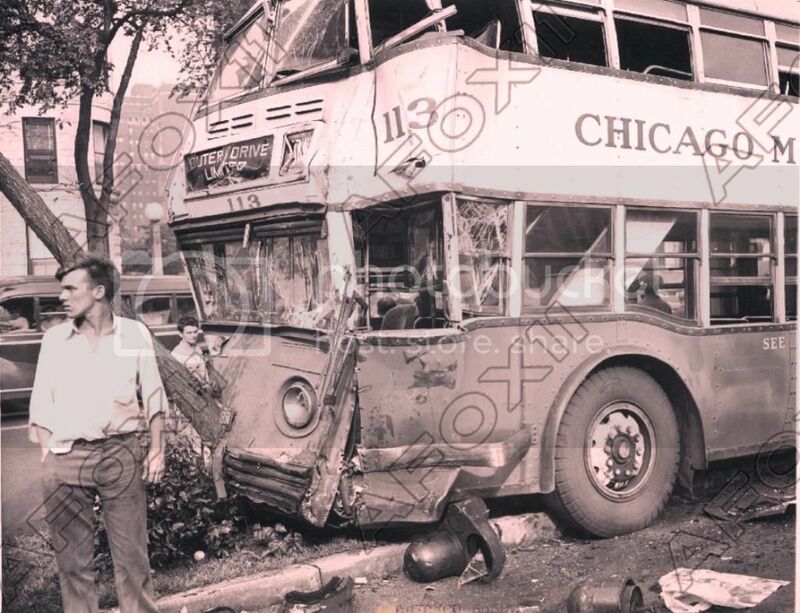 The fate of #113 is unknown to this writer but when considering that production was already in progress at GM on the single deck 55 passenger TDH 5502 which was slated to replace Chicago's DD fleet it is unlikely that it was rebuilt. One begins to wonder whether these early high profile buses, which were built exclusively for The Windy City and The Big Apple in the mid thirties, were too ungainly and difficult to control in emergency situations. Image courtesy of Acme Photo and is available through 'afox11' at eBay as item # 400716847211.